"Got Chucks on with Saint Laurent gotta kiss myself I'm so pretty!" - Bruno Mars, "Uptown Funk"
Paris Fashion Week may have ended on March 11th, but I've still been obsessing over Saint Laurent's Fall 2015 RTW collection. It's everything I could ever want. It's flawless. It's fierce. Can you tell I'm crazy about it yet? Saint Laurent has really outdone themselves for Fall 2015. The best way I can describe the collection is "punk chic." It's a retro punk rocker girl look with a modern twist. Leather, tulle, fishnets, and electric hues steal the show. My style isn't very "punk chic," but there is something about this collection that I just love. If I could own every piece, I would! Browse my favorite looks below and see if you're lusting over Laurent as much as I am! 1. One of my favorite looks from the entire collection. Love the pairing of the colorful dress and edgy leather moto jacket. 2. This sequin mini dress looks fabulous with fishnets and sleek heels. The pop of red on the lips is perfect. 3. Who knew a yellow leopard print dress and a quirky fur jacket could work so right together?! This juxtaposed outfit is fluorescent and fabulous. 4. Who wouldn't want a lipstick print dress? My favorite piece for sure. 5. This look has a baroque vibe that I'm digging. The gold foil-look dress is everything. 6. Minnie Mouse goes punk chic. Enough said. 7. Another amazing leather jacket! The tulle skirt, sheer shirt, and ripped tights are tough but girly. 8. Leopard coats are a weakness of mine. The little black dress makes the coat the focus. Are you obsessing yet?! What's your Paris Fashion Week favorite? love this collection! 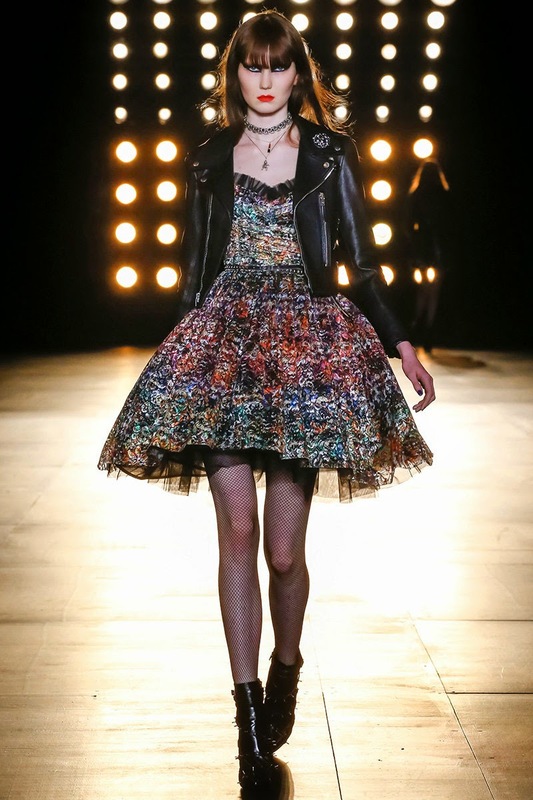 girly dresses and tough leather jackets are a perfect combo! Love Saint Laurent! This season was great as always. Saint Laurent can do no wrong! Wow, I just love runway models and this event is also looking wonderfully planned. Can you suggest me some good places like this for small NYC events. I am an aspiring fashion designer and want to do couple of events there.